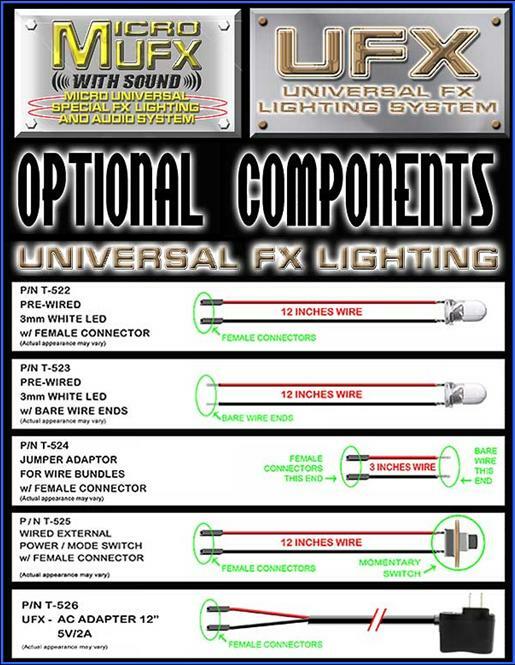 THE PURCHASE OF THE OPTIONAL UFX COMPONENTS AVAILABLE HERE ARE NOT REQUIRED. 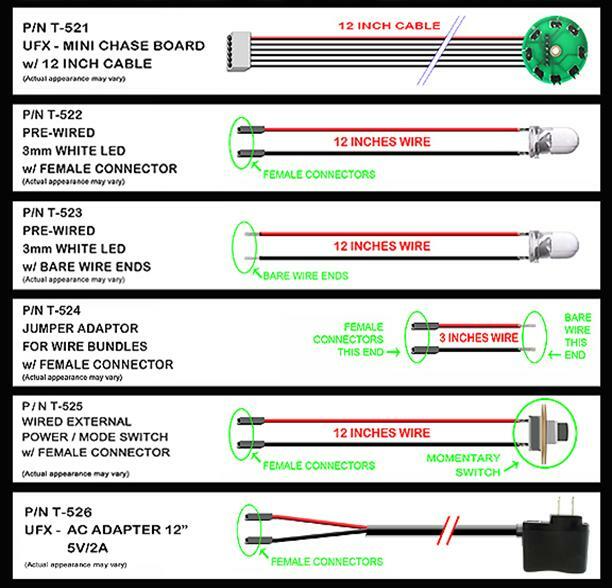 IF YOU KNOW HOW TO WIRE UP LED’S, YOU CAN LIKELY MAKE A LOT OF THESE CABLES UP WITH YOUR OWN WIRE AND LED’S. THESE ARE AVAILABLE FOR YOUR CONVENIENCE ONLY, AND ARE NOT REQUIRED TO GET THE FULL FUNCTIONS OUT OF THE UFX MAINBOARDS. THE PRE-WIRED LED’S ARE EXPENSIVE FOR ME TO PURCHASE, AND ARE REALLY ONLY FOR SALE FOR THOSE THAT WISH TO SAVE SOME TIME CONFIGURING THE UFX. THE UFX MAINBOARD ALREADY HAS MODE AND POWER SWITCHES BUILT ONTO THE SURFACE OF THE BOARD — THE WIRED MODE AND POWER SWITCHES ARE HERE FOR CONVENIENCE, AND MOSTLY ANY MOMENTARY SWITCH WILL PERFORM THESE FUNCTIONS IF YOU WISH TO WIRE ONE UP YOURSELF. THE M-UFX COMES COMPLETE WITH POWER CABLES, CORDS and SWITCHES. WHAT YOU DO IS COMPLETELY UP TO YOUR IMAGINATION! SELECT POWER OR MODE SWITCH OPTION!